Share the post "Himalayan Blue Poppy Or Tibetan Blue Poppy"
Genus: Meconopsis. It is a genus of flowering plants in the family Papaveraceae. It was first described by French botanist Viguier in 1814 who named it as poppy-like (gr. mekon poppy, opsis alike). 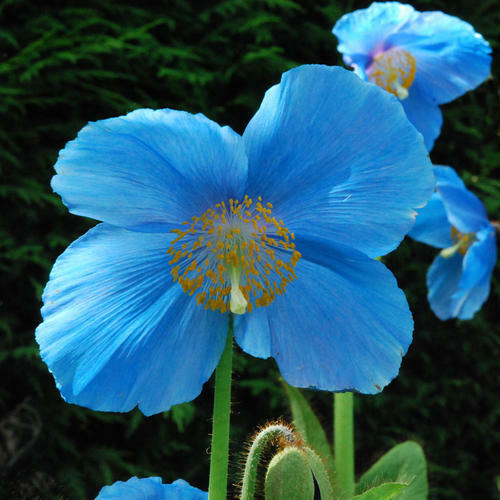 Himalayan Blue Poppy or Meconopsis baileyi, which had been known for many decades under the name Meconopsis betonicifolia, is a beautiful, short-lived perennial with striking, large blue flowers with contrasting yellow stamens. Flowers are shallowly cup-shaped usually with 4 petals and appear in late spring. The plant grows quite tall (1-1.5m, 3-5ft) from a rosette of hairy, oblong leaves. Himalayan Blue Poppy was discovered in 1912 by Lt. Col. Frederick Marshman Bailey, during the exploration of the Tsangpo river gorge in Tibet. Bailey sent a single bloom to David Prain, the Director of Kew Gardens, who believed that Bailey had found an entirely new species of Asiatic poppy. 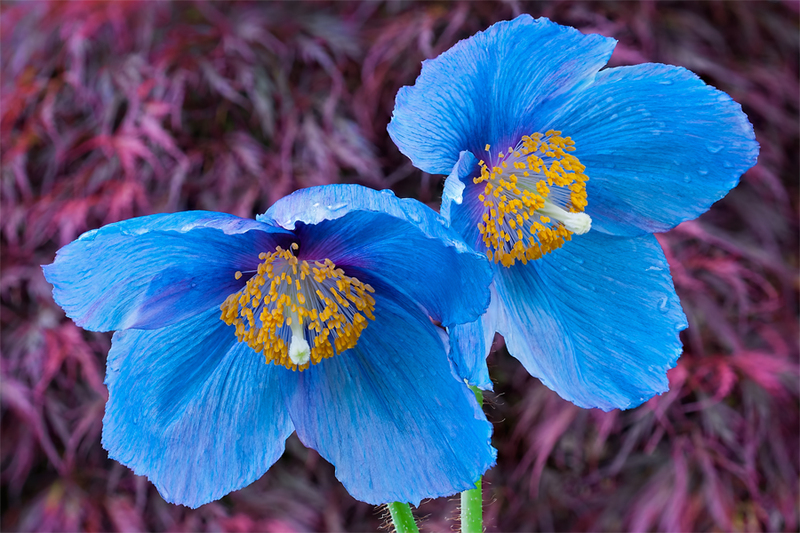 So, the flower was named in his honour – Meconopsis baileyi. The various big blue poppies are often confused, one with another. But Meconopsis baileyi can be recognised by the smaller flowers than in hybrids, a leaf-blade with a heart-shaped base, and barrel-shaped fruit-capsules with short styles. The capsules are clothed with short, dense bristles, and the seeds are almost spherical, about 1 mm in diameter. The shapes of the flowers and their shades of blue can be quite variable. Meconopsis have the reputation for being not the easiest of plants to grow, but they can be grown successfully if you follow a few basic guidelines. Himalayan Blue Poppy is from the same family as a regular poppy, but from a different genus, so it requires different environmental conditions. Meconopsis come from the mountainous regions of the Himalayas, Tibet, northern Burma and western China. These areas experience monsoon conditions with high rainfall during summer and cold with snow in winter. So, hey will clearly thrive best where the climate is cool and moist, but success can be achieved in warmer and drier climates as well. The seeds of the Himalayan Blue Poppy may be collected, cleaned and stored dry, in paper envelopes, in a closed plastic box in your fridge ready for sowing at the beginning of the following year. Plant pot grown Meconopsis in early spring or late summer as this will let the plant to become established. They will do best in shade (avoid full sun) in an open site with acid soil, sheltered from strong winds. Allow your pot-grown plants to self-seed, which they do happily in good growing conditions, and then leave the seedlings where they come up naturally. Meconopsis are not deep-rooted, so prepare the soil well. Dig in plenty of organic matter such as garden compost, leaf-mould or bark chips and well-rotted manure. In warmer drier climates, provide this organic matter around the base of the plants, but avoid the central part as this can encourage fungal rots. For a heavy clay soil it is recommended to dig in plenty of coarse horticultural grit. 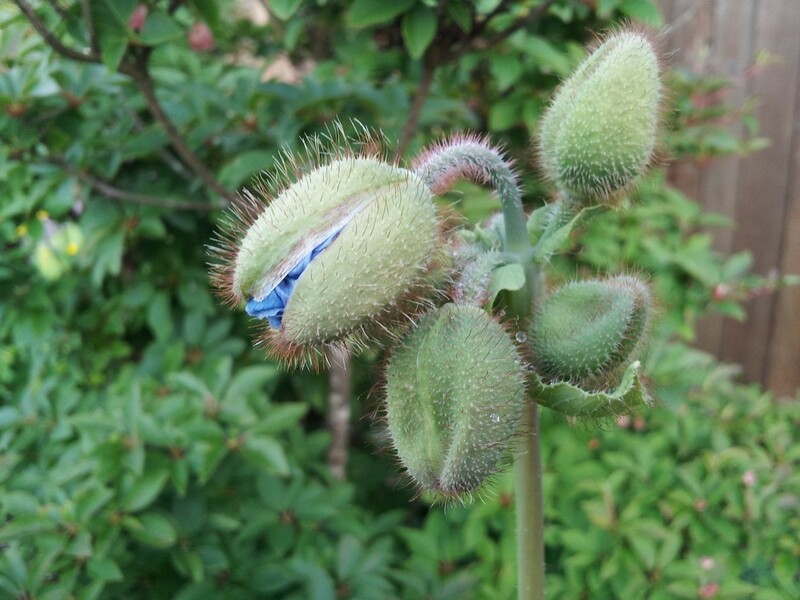 Moisture and good fertility are key for successful growth of the Himalayan Blue Poppy. Do not let this plant get anywhere close to drying out in summer. Meconopsis “Lingholm” is a fertile form which is believed to have originated several decades ago from a sterile hybrid (sterile means that these plants can be propagated only by division). Meconopsis “Lingholm” is probably the second most frequently sold form of Meconopsis. It is believed to be a most reliable selection, returning year after year with pure blue blooms. To help your plants be perennial, pinch out all flower buds for the first year. Meconopsis ‘Lingholm’ flowers are sky-blue but larger than in similar Meconopsis betonicifolia. In Meconopsis ‘Lingholm’, the bases of the leaf-blades gradually taper into the leaf-stalks and the leaves (especially when young) are clothed with long hairs usually with white tips. Seed-capsules are long, elliptical with prominent, long bristles. Viable seeds are plump, kidney-shaped and large (1 x 2mm). If the seeds are only small and flattish, they have not developed properly and will not be viable. 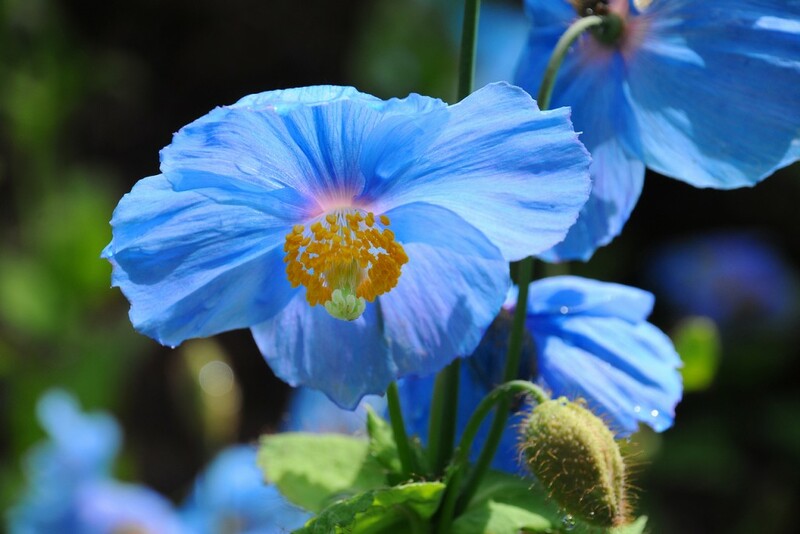 Planted in the right spot, Meconopsis ‘Lingholm’ will put out sky-blue blooms from May to July. Pair it with foxgloves in white (Digitalis purpurea f. albiflora) or pink (D. ‘Illumination Pink’. Add hostas, shuttlecock ferns (Matteuccia struthiopteris) or candelabra primulas (Primula bulleyana) for the woodland look. Meconopsis ‘Lingholm’ was, and still is, to be found under a variety of erroneous names, including the cultivar name M. sheldonii (sterile hybrid) and the species name, Meconopsis grandis. Meconopsis grandis is often confused with the hybrids and with Meconopsis baileyi and Meconopsis simplicifolia. Would you like to add something? Feel free to comment in the comment section below the article. Do you grow Himalayan Blue Poppy Or Tibetan Blue Poppy in your garden? What is your experience with this plant? Please share in the comments below! Do you sell Himalayan Blue Poppy Or Tibetan Blue Poppy seeds or have plants for sale? You can place your advertisement here. Contact us now!